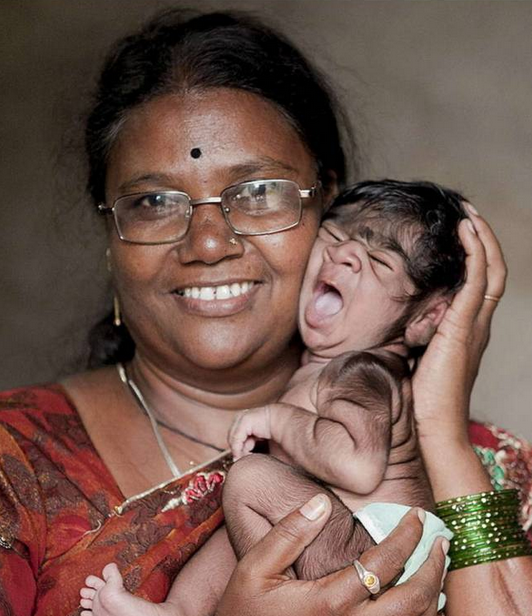 Although it has no name yet , but with its 21 days, it is already world famous: the wolf baby from India. Almost the entire body of the little girl from Madhavnagar ( about 380 kilometers from Mumbai) is covered with thick , dark hair . Unusual? Not in this family! Their mother, Sambhaji Savita Raut (26 ) and her sisters Monisha (19) and Savitri (17 ) have the rare genetic defect that leads to dense hair . They have inherited the disease, which is commonly referred to as werewolf syndrome, grandmother of Anita . ” Hypertrichosis universalis ” affects about one person out of a billion people. Worldwide, only a few hundred cases of mutation are known in which there is an overproduction of hair all over the body. The gene defect is considered incurable . The brave women trying to sprawl with hair removal creams to keep in check and want to get rid of their ” fur ” one day using a laser treatment. Yet they can not pay this though.